Thornton, Warley and Triangle are the pace setters in the Premier Division of the Spenser Wilson Halifax League after making it three wins out of three yesterday. Thornton’s Hutchinsons, Josh (133) and Nikki (102), took advantage of the fine weather and small ground at Bridgeholme to open their shoulders. Close-season capture Ben Burkill (90) also hit out and helped Thornton pile up 392-4. That proved far too many for their promoted hosts who replied with 171. Warley are also on 25 points after making their visitors Copley toil in the sunshine on the way to a 139-run win. Greg Keywood (58) and Faheem Khatana (55 no) helped them from a fairly unpromising 33-3 to 242 all out. Copley were soon 7-2 and when Alex Blagborough (41) was one of three batsmen out with the score on 60 the writing was on the wall. Cameron van Rensberg’s second successive six-wicket haul polished off the innings for 103, leaving Copley as the early trailers in the section. Triangle are just one point behind the leading pair after a six-wicket win at SBCI. Triangle had scored 503 the previous week, so SBCI were perhaps relieved to bat first. They lost both openers for ducks but Simon Wood followed up his 75 in the defeat at Northowram the previous week with 106. Triangle’s top six all contributed well, led by Chris Metcalf (52 no) and Dan Crosland (44), as victory was achieved in comfortable fashion. Bowlers were on top at Booth where the reigning champions continued to put their disaster against Warley a fortnight earlier behind them. Oxenhope were skittled for only 66 runs in 24.2 overs with Patrick Thomas (4-9) and Richard Laycock (3-22) leading the way but Booth’s batsmen then ran into their own problems. Five came and went and scored only 15 runs between them as Oxenhope sensed a fightback success of epic proportions but Hasnain Wajid was having none of it and hit 49 not out to clinch maximum points in the 18th over. Mytholmroyd and Southowram both picked up first wins of the season at home to Shelf Northowram HT and Sowerby St Peter’s respectively. James Cowens was Mytholmroyd’s star man at Moderna Way, even though he didn’t enter the fray until almost half-way through the contest. The number 11 batsman hit 36 not out to help Royd close on 273 and then took six for 52 as the Hedge Top side failed to take advantage of a 126-run opening stand from Kier Litjens (68) and Dan Cole (38) and were all out for 249. 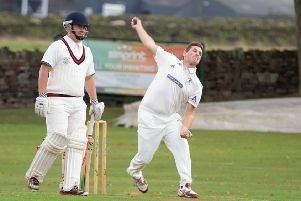 Southowram bounced back from their Triangle mauling with a 36-run win over Sowerby St Peter’s. Dean Crossley has been the Rams top batsman for some time and he top scored with 53 in his side’s 150, one of seven victims for Martin Schofield who bowled through the innings. Crossley then shone with the ball, taking 4-31 as he and Tom Bellfield (5-51) dismissed Sowerby for 114. 44): pts 4-10. *Warley 242-9 (Keywood 58, Khatana 55*), Copley 103 (Blagborough 41, van Rensberg 6-16): pts 12-3. Points: Thornton 35, Warley 35, Triangle 34, Shelf-Northowram HT 28, Booth 23, Southowram 18, Mytholmroyd 17, Oxenhope 16, Sowerby SP 12, SBCI 12, Bridgeholme 11, Copley 7.